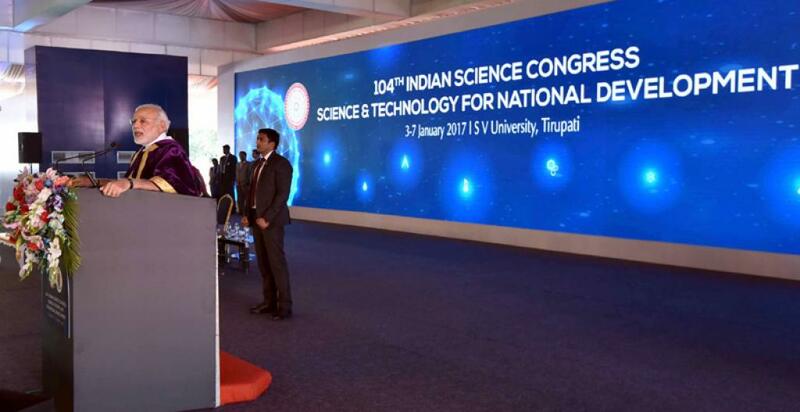 The 104th session of the Indian Science Congress was inaugurated by Prime Minister Narendra Modi today at Tirupati. The theme of meeting this year is Science and Technology for National Development. In his speech, Modi talked about the importance of scientists to respond to change. He said that a deep-rooted curiosity-driven scientific tradition will allow quick adaptation to new realities. He identified clean water, energy, food, environment, climate, security and healthcare as the important challenges that India faces. General President of the Indian Science Congress Association, D Narayana Rao, talked about how science and technology holds the promise to transform India. He also highlighted chronic underfunding and understaffing in this sector and stated that it was important to redefine the role of science in national development in the time of globalisation. He said that technological independence is needed along with political independence. Union Minister for Science & Technology & Earth Sciences, Harsh Vardhan, said that drastic changes in our thinking are needed to bring about fundamental changes.